Time, time, time. See what's become of me. (Paul Simon) a photo by Sol Lang on Flickr. Age and beauty. Is it a rule of nature? Or is it in the eyes of the beholder? I have always found intrigue in the aged, both inanimate as well as the living. 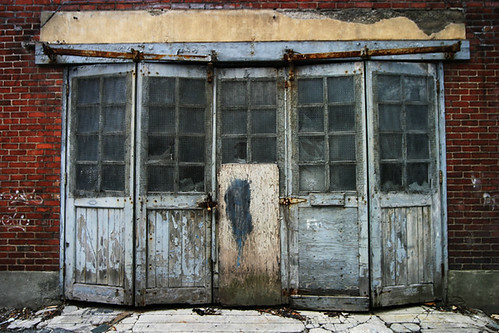 I was greatly moved when I came upon these old doors to a carriage house in a Plateau Montreal, back alley. The worn out rotting wood, rusty hinges and metal parts. The repairs and old paint. They all contribute to the emotional response of the viewer. This could not have been better than if it had been set-up and contrived. I love the discovery of such places when I am out by myself on a shoot. For the "Hinges" group, I hope that this image which I love so much, will be considered as complicit with the rules. However if the administration rulles that it does not, then do remove and accept my apology.